It's pouring outside as members of the Rosslyn BID's communications team unfurl four Rosslyn-branded purple golf umbrellas and parade up Wilson Blvd. toward Barley Mac for a lunchtime tasting. Torrential rain on a cold day will not keep us from our professional duty to collectively consume large quantities of food in the name of research. We take our responsibility to the neighborhood and to you, our readers, very seriously! One of Barley Mac's owners, Ryan DeMagistris, is waiting for us at the hostess stand when we arrive, soggy and windswept. Ryan's a member of the Rosslyn BID's Board of Directors, and he's generously arranged our tasting this afternoon. He escorts us to a cozy booth toward the back of the restaurant that has a good view of Barley Mac's open kitchen. A server instantly appears and asks if we want to order cocktails. "Um, do you really have to ask?" we think. What to get? Well, Barley Mac is known for its bourbon. It's a nice restaurant, but it's also a bourbon bar. So, when you go to a bourbon bar and you're reviewing food and drink, you order bourbon, of course. "How about The Inside Job?" we say. It's Larceny Bourbon, maraschino liqueur, absinthe, demerara sugar and angostura bitters. "You're welcome to go over to the bar to watch Kat make it for you," our server says. Never ones to pass up a great photo opp, we agree. Bartender Kat Malakhova, who moved here from Canada, is all smiles as we converge on the bar to watch her work her magic. The lunchtime scene is bustling despite the weather. "I like working here because I like making craft cocktails, and I get to do a lot of that," Kat says as she carefully singes an orange peel with a small blowtorch, which will give the drink flavor and aroma. "And the clientele are really nice. It's fast paced, too, which I like. I love it when people come in and just want me to make them something, but they don't care what. They'll just say, 'I like bourbon. Make me something.' That's fun for a bartender." She sprays the glass with an aerosol. That's the absinthe. Then she pours, mixes, stirs. You sense she's made hundreds of these. Soon, a beautiful drink appears, ready to be photographed and then consumed by four cold, wet and eager patrons. Paul, our photographer, likes bourbon and hard liquor. Our Writer Mary and Communications Director Maureen typically do not. And Social Media Specialist Justin is indifferent. So of course, Paul, our bourbon fan, LOVES it. And those of us who don't typically do bourbon still concur that this drink is good, and goes down very, very easily. It tastes refreshing, smooth and warm, and this is much appreciated after our battle with the wind and rain minutes earlier. It makes us bourbon skeptics understand why some people are so into bourbon. We'd order it again. Ryan comes over to show us a bottle of a high-end bourbon Barley Mac stocks, Knob Creek Single Barrel, which is brewed in Kentucky. Barley Mac's barrel of this particular high-end bourbon is one-of-a-kind. It has hints of brandy and cherries in it. Barley Mac's barrel will last about a year, so you can go in and ask for it specifically and know that you're tasting something unique. This traditional Tuscan appetizer is one of Barley Mac's most popular dishes. A sublime blend of textures and flavors, it features four fried dough balls sprinkled with salt and drizzled with truffle honey. Crispy outside and soft and chewy inside, the dough balls are accompanied by strips of salty proscuitto and creamy slices of stracchino cheese. They are great with bourbon, but our mouths water at the thought of pairing them with a crisp white wine. Chef Jeremy suggests making tiny sandwiches, but Ryan chimes in that he likes to eat all the components individually. However you eat this, it's a balanced, melt-in-your-mouth delight. We inhale them and get into major negotiations over who gets the last piece Maureen—the boss—pulls rank to prevail. This is her favorite dish on the menu and the team is happy to oblige! An entrée on the lunch menu and an appetizer for dinner, this dish features three plump and tender scallops, white bean puree, cubes of butternut squash and pork belly. Mary loves scallops but rarely makes them at home, so she has dibs on this one. 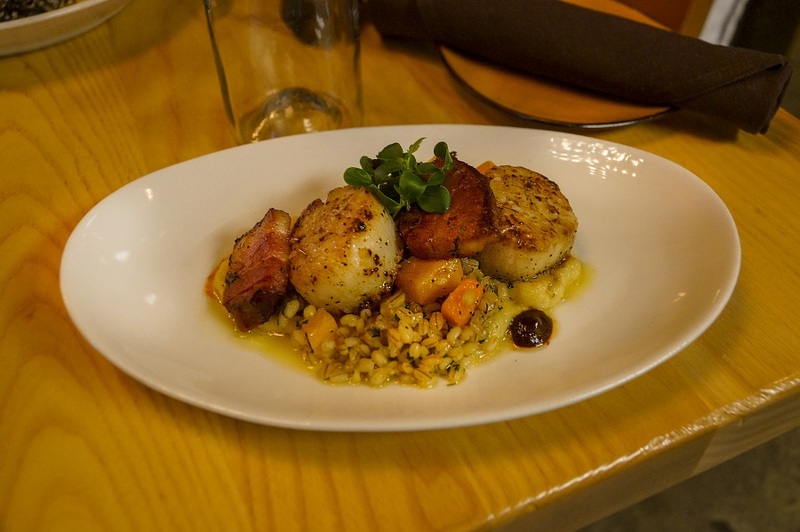 The well-seasoned scallops blend nicely with the creamy puree, sweet squash and smoky pork. Chef Jeremy has also given us some delicious barley on the side. It's not part of the menu, but he says he just felt like adding it for us. Well, we love it! It's not every day that a chef cooks something special for you. Food Director Mike Cordero loves squid ink linguine and wanted to be sure this was on the menu. After we try it, we understand why. We all think it's fabulous, concurring that the pasta is super-tender and tastes homemade (and it is, although Barley Mac doesn't make it in-house). It's served with roasted jumbo shrimp, crispy pancetta, tomato confit, wild mushrooms and a spicy champagne cream sauce. 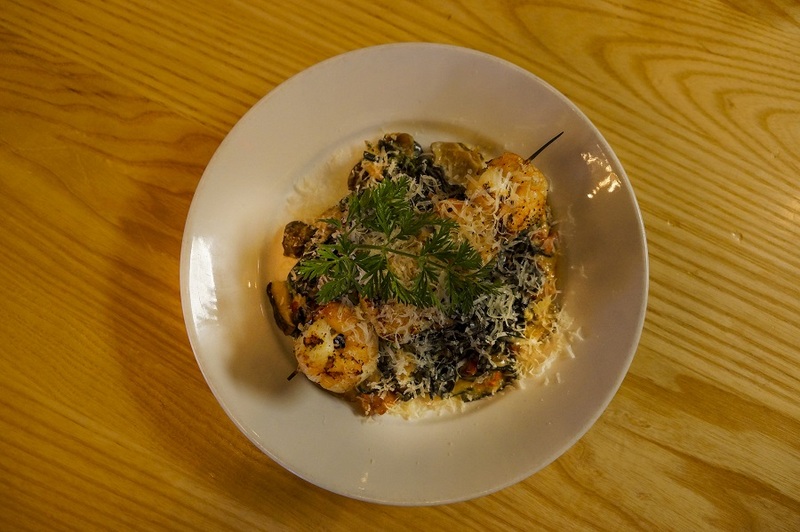 We note that the cream sauce has some peppery hints to it that mingle nicely with the linguini and the shrimp, which had a sweetness balanced by the earthy mushrooms. Paul seems to subtly inch this plate closer to him. And we thought he avoided carbs! We all count salmon as one of our favorite entrées, but we don't have a very in-depth understanding of how it's farmed and raised. Chef Jeremy tells us that the Verlasso salmon they use is special: It's Chilean, Grade A, one of the best kinds of salmon you can get. Barley Mac serves it with black risotto, broccolini and champagne cream sauce. We love the tender fish and creamy sauce. And the broccolini and black risotto are nice touches that add a gourmet feel to the dish. Who doesn't like a beautiful piece of seafood that's cooked perfectly and served with interesting and unusual accompaniments that taste delicious? Can't go wrong ordering this! This pork chop is substantial. It arrives, perched proudly atop a mound of sweet potato puree and we think, "Wow! Where are we gonna put all that?" We tackle it last, and when we say tackle, we mean that (almost) literally. We're careful not to elbow each other as we cut into this succulent treat. We succeed—although at one point Mary manages to knock over several items on the table (an admitted featherweight, she swears it's not because she's had too much of The Inside Job!). 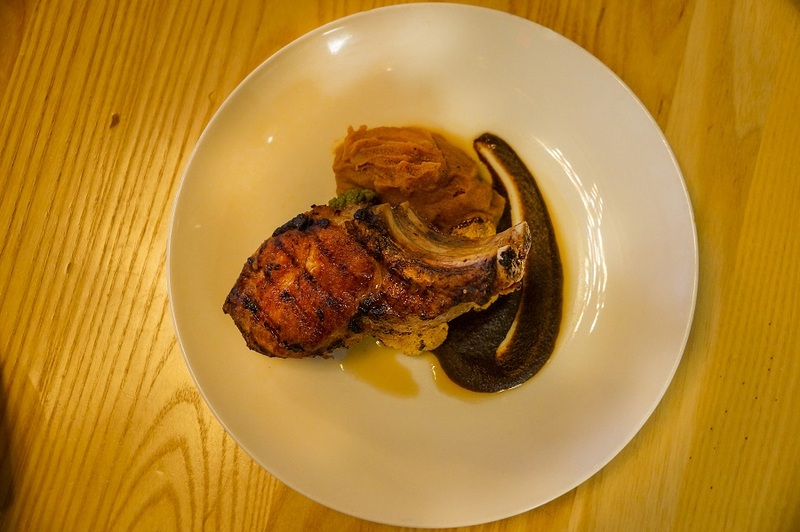 The pork is tender, crispy, juicy and totally indulgent. The sweet potato puree has a strong flavor (we think it's clove) that stands up nicely to this formidable piece of meat. Also starring in this dish is charred cauliflower and an assertive and smoky mole sauce that works well. Well played again, Chef Jeremy! He tells us we're eating Duroc pork, which is farm-raised, all-natural and hormone-free. "We embrace the concept of farm to table in all our dishes," he says. At this point, we're spent. Ryan checks on us before heading out to a meeting. We're fed, happy and ready to face the wind and the rain again. Ryan is quite an entrepreneur, we note. His team co-owns not only Barley Mac, but also A-Town Bar & Grill, Don Tito and G.O.A.T. Sports Pub. He's proud of Barley Mac as the restaurant that has broadened their horizons compared with their other, more informal establishments. "This is our [more upscale] sit-down restaurant," he says. "We wanted an open kitchen, and we have that here, and many of us like whiskey, so we wanted it to be a bourbon bar, too. We have Virginia beers and Virginia bourbons, and our bartenders really know their stuff, making it an experience to come here if you're a bourbon drinker. I love the food, too, and love that you can see it being made in the open kitchen. We think we fill an important niche in this neighborhood, and we're glad to be here." 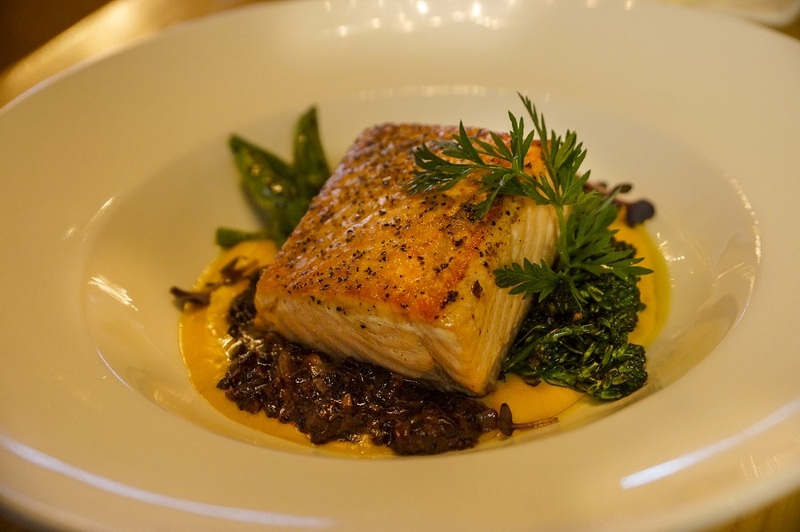 We hope you'll visit Barley Mac to try some of these delicious dishes. If you drop by, let us know which ones are your favorites! Email rosslynbid@rosslynva.org or connect with us on Facebook, Twitter or Instagram. 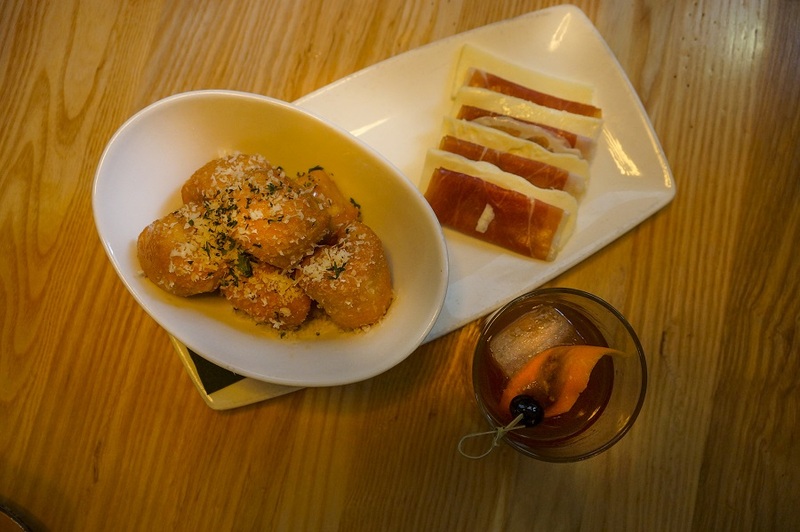 Rosslyn restaurants: Want us to come sample and share your menu? Email us at rosslynbid@rosslynva.org. Photo at top: One of Barley Mac's owners, Ryan DeMagistris, holds The Inside Job, a wonderful bourbon cocktail that was just prepared for us by bartender Kat Malakhova in background.